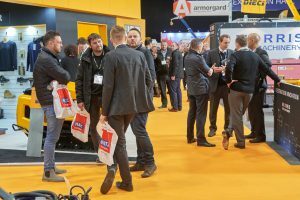 The tool, equipment and compact plant hire industry is going from strength to strength following reports from the organisers of the Executive Hire Show 2019 (6-7 February Ricoh Arena, Coventry). During the annual exhibitor ‘Kick-Off’ meeting at the Ricoh Arena, which took place last week, the team reported that an impressive 159 exhibitors had already signed up for the 2019 Show and the event is now 90% sold. The ‘Kick-Off’ meeting attracted a record attendance, with exhibitors both old and new taking time out of their busy schedules, to attend the event and listen to the EHS team talking about the ‘all new’ look for the 2019 Show. Now in its 13th year, the event organisers felt that the Show needed a whole new look to refresh and reinvigorate it for exhibitors and visitors, – so a complete redesign was undertaken. 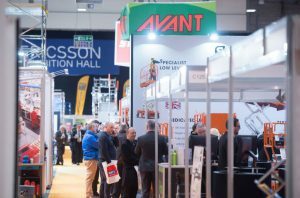 Many of the exhibitors have increased their stand space including UK Caterpillar dealer Finning and access equipment manufacturer Snorkel UK. Armorgard Security Products have doubled the size of their plot and the Show is also delighted to welcome excavator manufacturer Takeuchi back to the Show after a two-year absence and construction machinery manufacturer Mecalac will also return. Check out the latest complete exhibitor list on the EHS website. There’s not a conference or a meeting currently taking place that does not mention the ‘B’ word and the EHS Kick-Off meeting didn’t shy away from the elephant in the room. Executive Hire Show’s, Alan Guthrie, spoke openly about Brexit – and how hire companies are not letting the harbinger of doom impact on business. – He suggested that, when the UK does leave the EU at 11pm (UK time) on 29 March 2019, it need not affect the hire market unduly. Attention then focused back on the Show and it was announced that back by popular demand is the Innovation Trail. The Trail was first launched in 2013 and innovation continues to be an integral part of the Show. Last and by no means least, exhibitors and guests were reminded about the EHS 2018 series of industry Road Shows. The next is being held in Cobham, Surrey on 18 October, followed by Haydock on 14 November and Bristol on 5 December. At these popular regional events, hirers and suppliers can benefit from bargains available only on the day that could boost their business. As well as hearing presentations on key issues and trends, participants will network, catch up with existing contacts while making new ones, and generally get involved. And these events are an exciting prelude to the Executive Hire Show. With Brexit scheduled to happen the following month, the timing could hardly be better, enabling hirers to explore new revenue opportunities, do deals and build a positive future. Make sure you are part of it!